In this follow-up to “From Beginner To Expert in 40 Lessons”, Aleksander Kostyev concentrates on the challenges of practical play. It is ideally suited for the club and tournament player who has reached a certain standard and wishes to improve his or her game. The material is equally suitable for the curriculum of a chess course run by a strong player or for self-instruction. A number of complete games illustrate important opening and middlegame themes, while great attention is paid to the basic endgame positions that should be essential knowledge for anyone aspiring to "master class". 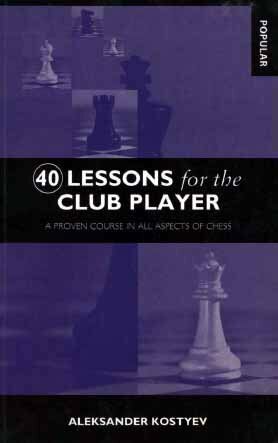 The teaching methods encapsulated in this book were responsible for the enormous growth in Russian chess and for the string of top players who have dominated the world scene for many years.